Submitted photo Wump Mucket Puppets, created and performed by Terrence Burke of Cincinnati, have been entertaining audiences since 2010. 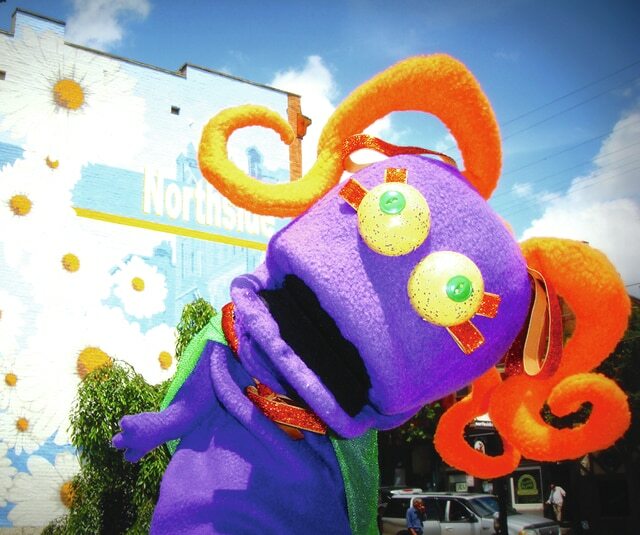 GREENE COUNTY — A Cincinnati-based puppet troupe will be coming to Greene County in late July. The Wump Mucket Puppets will give three free performances in Fairborn, Bellbrook and Beavercreek. The puppets will be featuring their new skit, Super Space Princess and the Pirates from Zwonk. This original sci-fi fairy tale is about an alien princess who finds her super power to stop space pirates from raiding her uncle’s palace. The show also features original tunes and cheesy jokes. The Wump Mucket Puppets will perform at 10:30 a.m. Tuesday, July 28, at the Fairborn Public Library, located at 1 E. Main Street. Advanced registration is required at the library. They will also perform at 10 a.m. and 1:30 p.m. Tuesday, July 21 at Bellbrook Presbyterian Church and Peace Lutheran Church Fellowship Hall, respectively. Advance registration is required at each city’s public library. A meet-and-greet with the puppets and their puppeteer will follow each performance. For more information, visit www.WumpMucketPuppets.com.